Please keep the date of Friday January 25th, Protected content , 20h00 . 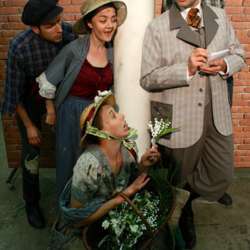 ADG-Europe in collaboration with TNT Theatre Britain will present ''PYGMALION'' by Bernard Shaw . ''Pygmalion is a masterpiece of English (or Irish!) dramatic literature. Indeed, the play is full of wise woman and foolish men, which in the world of ''hash tag Me Too'' is a good place to start a play. A great comedy that you should not missed!